Thursday’s here and I have to say it’s a darn good feeling to finally see the sun peeking through and temps reaching into the 80’s – nothing like it. Drawing is very satisfying to me, I find it relaxing and allows me time to think about life and what’s going on. But progress on Sorrow was slow today, definitely not as much as I would have liked. I had to slow down and take time to examine the statue’s back, the flow of fabric, the lights/darks that are normal aspects to fabric folds, and finally the patina – nature’s wear and tear on this beautiful structure. The drawing (12×9) is being done on Strathmore paper using graphite pencils: 4H, 2H, HB, B, 2B and a bit of 6B. Finally I began to draw in some of the prominent patina that gives the statue character, guess I wanted to get a feel for it, so if you look closely on the right-hand side you’ll start to see the stains of rain. Next week I plan to finish her back and where much of the fabric gathers at her knee, that will leave me in a good place to begin drawing her headdress. Mary I love a farbric in painting you make it look majestic every week. Thank you Doron – interesting balance between mimicking stone and fabric. 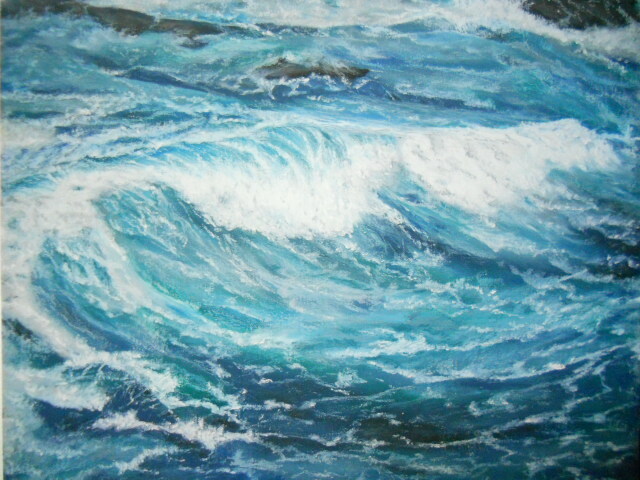 I see the rain stains emerging …very much progressing Mary … I can tell you are very involved …such an artist . Thank you so much Poppy, beautiful compliment and I appreciate it. I do love this process of drawing for only 30 minutes a week, you nailed it, I do find I get very connected to the subject. Have yourself a great weekend Mary! To smell the roses I bought myself some and daffodils for added perfume. Spring has arrived indoors! Cheers! Now that’s what I’m talking about! Yeah – have a great weekend too! 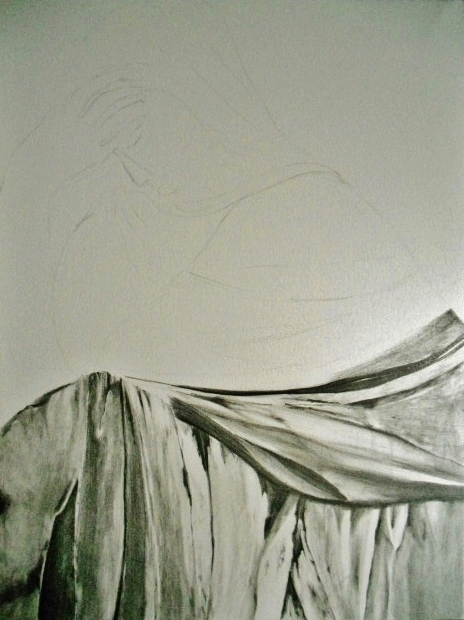 Mary there is already a quiet drama beginning to take shape in the dark to lighter transition from left to right in the fabric folds, the beautiful composition of this drawing is emerging as well.. i admire your courage, this is quite an ambitious project. Thank you very much. I love the process of drawing in stages like this, a very good exercise because it allows me to get very close to the subject. Feeling the process as it comes into being, not just a drawing but the subject takes on a life of its own. Mary – Your drawing is superb of the folds in the fabric. I can’t wait to see Sorrow emerge. Thank you Dorann – emerging Sorrow is what will give me the most angst in this drawing. Can I bring the piece to a range of surface emotion that I’m looking for? We’ll all stay tuned. Have a great weekend, happy Spring to you! Thanks Marina for your lovely greeting! Weekend is shaping up to be a very busy time. Drawing, for an artist, is perhaps what a first draft is for a writer. The mind is more fluid, less focused on making things right. Good luck with your work and thank you for reminding me to smell the roses. Thank you so much Evelyne. Yes, I suppose you are right about the similarities between a writer and an artist – for me it’s all about feeling the art as it comes alive. Hi Rhonda, thank you so much for your compliment and feedback – I really appreciate it!